Key West is a two-by-four-mile island. “Ocean highway”, U.S. route 1 starts at Key West. Many people choose to drive the 155-mile route from Miami to Key West. The island is actually closer to Cuba than to Miami. The Ocean highway passes over several keys inhabited by the endangered key deer. Recent estimates put the its population between 300 and 800. The Hemingway house in Key West. A view of the garden from the second floor veranda. 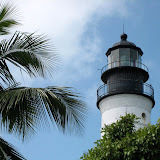 The Key West lighthouse is seen in the distance. Related reading: Hemingway at Sea - New Books About Ernest Hemingway - NYTimes, 2011. Weekend In Miami: An Overview. Gadling.com. 36 Hours in Key West, Fla. NYTimes, 04/2007. Key West's dead raised to learn their secrets. CNN, 11/2007. Related reading: Hemingway at Sea - New Books About Ernest Hemingway - NYTimes, 2011.